Another view of the Vauxhall milk jug. 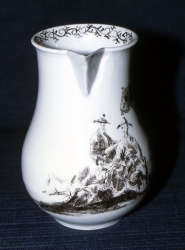 This Vauxhall milk jug is printed in black enamel with a rare design of three Chinese figures attended by a Chinese woman holding a large parasol. The print has some additional over-painting in a black wash. The jug has a painted scroll border on the inner rim that is distinctive of Vauxhall.